Now officially a Wall Street Journal, Amazon and New York Times bestseller. More than 50,000 sold in just a few weeks. Here’s a free PDF excerpt from the uncorrected galleys. And we’re trying something new: Your reviews, on video. To see some of the reviews we’ve already received, check this out. We’ll be relaunching The Marketing Seminar in January. This is a magical workshop, a 100+ day interactive experience with cohorts and project work and connection and more than fifty videos. The book is based on this experience. If you click the link above, you can sign up to be notified when the course goes live. If you’d prefer to simply watch the 50 videos, please do! More than 40,000 people have taken my Udemy courses, and you can find the Marketing course here. You can go at your own pace and start any time. Thanks for reading. Can’t wait to see what you’ll ship next. “With the increased use of social media platforms, many marketers (that’s me and you), have been focused on the masses. We want to be like everybody else. We’ve been focused on likes, Tweets, views, shares and other things that have little long term meaning. We’re focused on looking at the “other gal” and comparing sizes. We’re focused on looking at our 1 (or none) reTweet compared to the thousands some celebrity received. In This is Marketing, Seth reminds us what true marketing, long term marketing, human marketing is really about. It’s about building trust, creating a connection, enabling an emotional bridge between your solution and the need that someone else has. Buying ads is easy. Handing out flyers is easy. I’ve done it. “I’ve owned my business for 21 years, but Seth Godin’s book, This Is Marketing, has transformed the way I think about marketing my business. I think this book could be called, The Philosophy of Modern Marketing, or Marketing that is Truly Effective. I used to think of marketing as a series of tasks I needed to do each month in order to drum up new business. Now I see marketing as a noble adventure with the intent to create meaningful change in some part of the world. On page 144, Seth talks about “your quest to matter.” That’s a beautiful way to some up his perspective on marketing. It’s not a task. It’s a quest, a call to adventure, something in sync with Joseph Campbell’s work on The Hero’s Journey. He points out that the primary purpose of marketing is to create change in the world; meaningful, positive change. Do you see what I mean? Over and over and over Seth is teaching a new philosophy of modern marketing. Decide on the change you want to make, decide on who to change, and make a promise as to what those people will gain from you to make that change. This book is not a quick read. It’s a cheesecake book. Take a bite, read a page. Think about what it means. Think about your answers to his questions. Write them down. Then go to the next page. Slowly your marketing design will emerge, and I believe it will be very helpful to you. 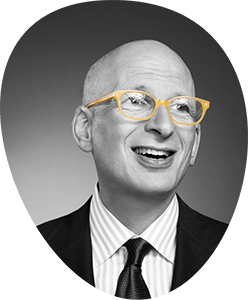 “More than a year ago, I joined Seth Godin’s The Marketing Seminar. There I learned new marketing techniques that I could apply to make positive difference in the world happen. Not only were the lessons super interesting, they were also insightful. Seth’s thinking changed the way I look at the world. He and other coaches from TMS opened my eyes to the real social problems that our society is facing right now. The same people helped me also find meaningful solutions to these problems. Therefore, I would like to thank Seth for making The Marketing Seminar accessible and affordable. Without the right pricing I would’ve never joined. This Is Marketing, the latest book by renowned marketing expert Seth Godin (Purple Cow, Linchpin and The Dip) is based on his online workshop The Marketing Seminar where people complete assignments in an open forum and with a focus on cross-pollination; people helping each other by providing feedback and learning from each other along the way. In clear bursts the book takes apart your concept of marketing and rebuilds it, each chapter taking a different idea and, by providing anecdotes, case studies and other examples, allows you to get a clear grasp of how to best reach your intended audience. The journey the book takes you along is one where you first relearn what marketing is, through the different ways that people perceive a product and through the stories you can tell with the different characteristics of your product. One last thing: We’ve created a special collectible edition of the book. There are only 2000 sets. Because you’ve been so diligent and read all the way to the bottom of the page, I’d like to give you a first look at what it’s about. Here are two quick preview pics. There are more hints at the site. Hurry!